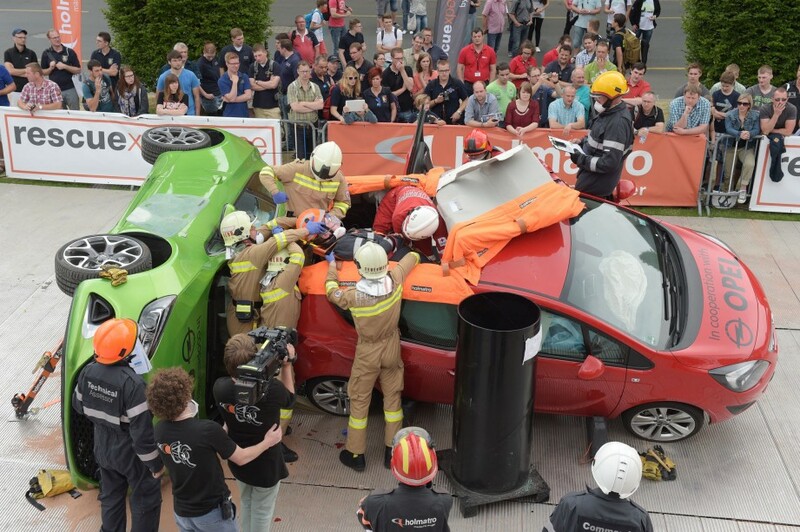 During this years’ INTERSCHUTZ exhibition from 8-13 June 2015 in Hannover, Germany, Holmatro organized a special edition of the Holmatro Rescue Experience: The 35,000 Euro Extrication Challenge. This 6-day international event is supported by the INTERSCHUTZ organisation (Deutsche Messe). Extrication teams have signed up for this challenge in great numbers through the event website http://live.holmatro.com. From all registrations a total of 29 teams have been chosen at random with a maximum number per country and continent. These teams represent no less than 16 different countries: Poland, Hungary, Austria, France, Spain, Italy, UK, Slovenia, Germany, Sweden, Finland, Norway, The Netherlands, Belgium, Ireland and Brazil! During the Challenge each team showed their skills in a realistic vehicle extrication scenario using modern vehicles. Besides the honour, they were competing for one of the three fantastic prizes (rescue tool sets) worth € 35,000 in total! During this 6-day Extrication Challenge one team after another was challenged to respond to a unique 20-minute vehicle extrication scenario using Holmatro rescue equipment. A unique opportunity for all rescuers, who were able to practice their skills on the latest vehicle models. Before getting hands-on with their scenario, each team received a Holmatro Rescue Equipment Familiarisation Training by Holmatro instructors, including a Masterclass on Practical Cutting Techniques. In addition to the competition, this Rescue Experience also offered a lot of entertainment to all visitors of the world’s leading rescue exhibition in Germany. During the intermissions of the Extrication Challenges visitors were invited on stage to compete in the Holmatro Game of Skills. A game were you have to move a ring to the end of a spiral, using a Holmatro tool, without making contact at any point. If you completed the game without errors, you received a Holmatro SafetyPen (Window Punch and seatbelt cutter in one). And, on each day of the INTERSCHUTZ, the player who finished the game quickest won an Apple iPad mini 3! Holmatro’s own Rescue Consultant, Ian Dunbar, is responsible for the Rescue Experience organisation and set-up of the various extrication scenarios. A group of experienced international assessors supervised each scenario and determined the overall winners. Contestants were judged on their performance in command and on their medical and technical skills. 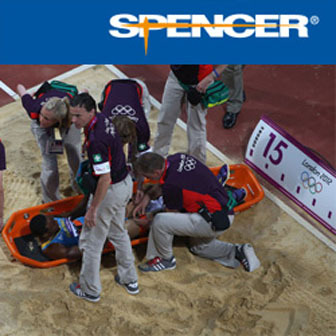 Judging criteria include use of the Team Approach, use of rescue techniques, medical assessment, victim handling, on-scene communication and general performance. And last but not least, the overall team spirit was also rewarded! The whole event was broadcasted live on the event website http://live.holmatro.com. Family, friends and colleagues at home could follow what was happening and watch the teams in action during the Extrication Challenge. Holmatro designs, develops, manufactures and supplies hydraulic equipment and systems for fire & rescue departments, special tactics teams (navy, army, police), and industrial applications around the world. As a specialist in high-pressure hydraulics Holmatro continuously invests in research and development of new products. Besides its main office in the Netherlands, Holmatro has representative offices in the USA, China, UK and Poland. Holmatro products are known to be innovative, high quality and above all effective under the most diverse conditions. With an extensive dealer network, Holmatro is dedicated to producing high-performance solutions for specialised industries across the entire globe.